Daily Pivots are calculated from the high, low and close of the previous day’s session. This information is available prior to the start of the current day’s session and does not change throughout the day. The Library Pivot version can be compared to the Premium Pivot version here. Session Pivots Daily are a well known trading technique used by market makers and were frequently used by local pit traders to calculate intraday support and resistance points. The technique has been around for decades, and because of its simplicity and efficiency, it is still in use today. 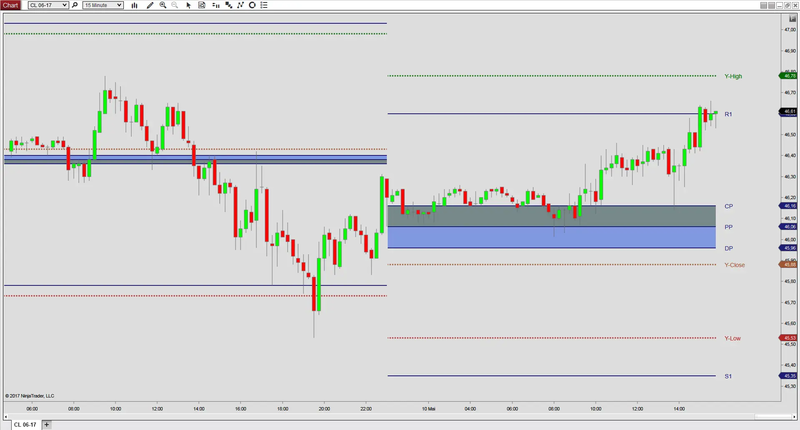 The Daily Pivots display GLOBEX (ETH) pivots, calculated from the high, low and close of the past full session. If you want to display floor pivots (high, low and close of the past day’s regular session), please refer to the premium version. The Daily Pivot indicator is used to display the main pivot as well as the central pivot and directional pivot, in addition to 4 major support and resistance levels. The indicator also comes with an option to display mid-levels pivots. Furthermore, you may choose between four (4) different formulas, namely Floor Pivots, Wide Pivots, Jackson Zones and Fibonacci Pivots. Finally, when set to “Daily Bars” the indicator will display correct pivots for extended trading days that occur after public (US) holidays.